Ahead of the American Visionary Art Museum’s 21st Annual Kinetic Sculpture Race on Saturday, May 4th, join Race Pace Bicycles for a casual group ride departing from Race Pace Bicycles, 1414 Key Highway, Baltimore. We’ll cruise through the Federal Hill neighborhood, riding along part of the route that kinetic sculptures will conquer during the race. We'll end at Little Havana Restaurante y Cantina at 1325 Key Highway, to enjoy happy hour specials. The ride is free, but please bring cash/credit for Little Havana specials! Colorful attire is encouraged. This event is weather permitting. You can check American Visionary Art Museum’s Facebook page for updates in case of inclement weather or call us the museum at (410) 244-1900. If you love Baltimore, community, music, food, and good vibes join us the last Thursday of the month to mingle with other like minded people. Bike and Brunch Tours will host its monthly Maintenance and Mingle event with special co-host No Boundaries Coalition! Come and tell your friends. We will also have happy hour specials that include food. What more do you need for a good time. Oh yes, specials! We'll have those too. Happy hour specials include drinks and food favorites. They range from local beers, wine, and non- alcoholic items and food for vegans and carnivores alike. Get information, ask questions and learn about their services, merchandise, and more. If you like, join us for a short conversation about bike tips or maintenance break-out session during the happy hour. No bikes or bike know how required. This event is open to all. Mingle among the company of other local bike riders at all levels, find ride partners, find out about local events on and off the bike, and connect to people engaged in building community and preserving history, legacy, and culture during what will be a very happy hour and a one of a kind event. BYKE is 5 years old! Come enjoy spring as BYKE celebrates 5 years of success, we welcome Jasper Barnes as the new Executive Director, and say goodbye to Chavi! Presented by the AIA Baltimore Committee on the Environment and Resiliency (COTE |R), Urban Design Committee (UDC), and Rails to Trails. Registration includes a complimentary Baltimore Greenway 2019 t-shirt. Funds raised will go to support Rails to Trails. This year’s urban bike ride explores the Western and Southern loops of the Baltimore Greenways Trail Network and efforts led by Rails to Trails to create a world-class network of connected urban trails in Baltimore. AIA Baltimore has joined Rails to Trails as an advocacy partner in the effort to complete the 10 additional miles needed to close critical gaps through 50 neighborhoods and help reverse the urban fragmentation. Former rail lines, industrial coastlines and reconfigured roadways will be transformed from barriers in the built environment to community-based assets centered on trails. This will change the way Baltimore residents work, live and play—and generate myriad long-term impacts related to social equity, health, environmental conservation, active transportation and economic development. This tour focuses on a mostly flat 11 mile stretch that includes the Western and Southern loops of the trail, and passes through the South Baltimore neighborhoods of Sharp-Leadenhall, Pigtown, Carroll Park, Westport, and then through Middle Branch Park with a view of the Patapsco and where the Hanover Street Bridge spans Cherry Hill to Port Covington. We’ll hear from Rails to Trails and community leaders about trail plans for the area. The natural waterfront areas along the Middle Branch—ecologically rich and home to some of the best waterfowl seeing—go largely unnoticed, hidden behind vestiges of industry and underneath highway interchanges. Better access by trails will help to strengthen the natural assets of Baltimore’s lesser known harbor. The ride is about 10 miles and will begin and end at the Checkerspot Brewing Company. Parking is available in the lot under 395 that is directly across the street from Checkerspot on S. Sharp. Street. Stick around after the tour for drinks at Checkerspot! In case of poor weather, the rain date will be Sunday, April 28, same time and location. Help make phone calls to our supporters and remind people about our Members Meeting! No experience is necessary, we’ll provide the script! All you need to bring is yourself and a cell phone. Help build a force for biking in Baltimore! >> Sign up to volunteer here. From the American Visionary Art Museum: a race through Baltimore of wacky, imaginative, totally human-powered works of art, designed to compete over land, a mud pit, and the Inner Harbor, constructed out of used bicycles, gears, and parts, created by a lunatic genius who tinkers around in the garage or backyard (do you know this person?)! This year's theme is "Wheel-ality TV," inspired by our current mega-exhibit, PARENTING: An Art without a Manual. Pilots ("Kinetinauts") compete for the most coveted GRAND MEDIOCRE EAST COAST CHAMPION AWARD (finishes right in the middle), and the highly prized NEXT TO THE LAST AWARD (finishes, well, next-to-last), and other serious trophies including ART, ENGINEERING, BEST BRIBES and more. Race starts at 10am at the American Visionary Art Museum (arrive early to take part in Opening Ceremony and Blessing of De Feet). - and, of course, anywhere along the 15-mile route through Baltimore! Join Team BBC p/b Baltimore Bicycle Works for an ALL-NEW CRITERIUM in downtown Baltimore on Sunday, May 5! Featuring thrills, chills, and COBBLES. Some organizations mail you an annual report. We like to put those resources toward the thing that's most important to you — fighting for bikes. Join us for our Members Meeting where we recap our big wins, discuss the health of our organization, and unveil our brand new strategic plan. To attend, please RSVP below by purchasing a ticket that fits your budget and affirms your support. We can't do it without you. Ride for the Feast 2019 is a 2-day, 140-mile Maryland fundraising bike ride from Ocean City to Baltimore City. The Ride raises money for Moveable Feast www.mfeast.org, a longstanding Baltimore nonprofit organization that provides lifesaving, nutritious foods for low-income Marylanders living with HIV/AIDS, cancer, and other life-threatening conditions at no cost. Serving 14 Maryland counties, in 2018, Moveable Feast delivered 743,940 life-saving meals to homes, shelters and drop-in centers, serving a total of 5,060 Marylanders. We ride 140 miles because that is the exact distance a Moveable Feast driver must go to deliver to our farthest client. Over 200 riders and at least 100 volunteers sign up each year for this event. The Ride, which began in 2003, has become one of the largest sources of funding for Moveable Feast. Riders and crew return year after year to be involved in this event because of the amazing people involved and for knowing they are making a difference in the lives of Moveable Feast's clients. If you're interested in riding or volunteering for this event, register now at www.rideforthefeast.org. Questions? Contact Events Manager Carin Prescott at cprescott@mfeast.org. Stop by on your morning commute for free coffee and a chance to talk about the future of bicycling in Baltimore with Bikemore’s staff! TransportationCamp Baltimore is back for a second year! Join us on Saturday, May 18th at the University of Baltimore Merrick School of Business for a transportation unconference lead by attendees (you!). Our objective is to bring a more inclusive and engaging forum about transportation to the people who use, plan, design, build, advocate for, hack, or just feel passionate about transportation. Bikemore is a proud sponsor and supporter of this year’s TransporationCamp Baltimore! Join the American Diabetes Association at the 2019 Maryland Tour de Cure: it’s more unified, inclusive and powerful than ever before, with ride, run and walk options for the whole family! All riders, runners, and walkers will be treated to a fantastic celebration party for all to enjoy. Participants can also earn Tour de Cure apparel! 17th Annual Tour dem Parks, Hon! Tour Dem Parks, Hon is Baltimore’s premier annual recreational bike ride! Choose from 4 routes (between 5 and 35 miles) for a close-up view of Baltimore's parks and neighborhoods. Each ride is different, and the longest includes Druid Hill, Gwynns Falls, Carroll, Patterson, Clifton, Herring Run, and some quietly tucked away gems. Start and end point is behind the Rawlings Conservatory & Botanical Gardens in Druid Hill Park. Riders depart between 7:30 and 9:30 depending on route chosen. The ride is fully supported, including well-stocked rest stops and SAG. Enjoy burgers, dogs (veggie options, too), and live jazz at the post ride BBQ. Discounts! Save up to $17 by registering early. Price on ride day: adults $55, youths (15 & under) $20. Register by MAY 15 for guaranteed Tee shirt/tank. Proceeds support Baltimore's parks, as well as environmental, "friends of parks", and cycling groups. Poster by the wonderful Adam Miller. If you’ve got a previously loved bike to sell, a spot in the bike corral is $15 per bike. We will watch over your bike all day so you can head out to shop! Got a bunch of old parts and doodads? Well a full vendor table is only $45! Vendor tickets can be purchased at either of our shop locations, or online at our web shop. Not sure how to keep riding once you have kids? Trying to figure out how to transition your kid onto their own bike? Want to connect with other families who also want to ride in Baltimore? Join Bikemore and Baltimore Family Bike Party for an open house style event full of different bike setups, resources, and more to help you feel more comfortable riding with your family. We'll have parent led workshops, activities for kids, bikes to test ride, local organizations tabling, and tons more! >> RSVP + invite your friends! The Baltimore City Department of Transportation (BCDOT) begins it series of community engagement meetings through the month of March. The meetings scheduled in the Northeast, North West, Southwest and Southeast portions of the city — provides residents the opportunity to see BCDOT initiatives and upcoming projects their sector of the city. These meetings are a great opportunity to provide input on traffic calming and complete streets in your neighborhood! Inspiration. Empowerment. Connection. The power of bicycle travel. Come find all of these at a special regional gathering of people interested in bicycle travel hosted by Adventure Cycling Association in partnership with Rails-to-Trails Conservancy, Bikemore, and WTF Mid-Atlantic Bikepacking. Mingling starts at 6:30 PM, and the program starts promptly at 7:00 PM. Our friends at Race Pace Bicycles are hosting a meet and greet with Jens Voigt — and the ticket proceeds are benefiting Bikemore and Bike Maryland! Don't miss your chance to rub elbows with the most charismatic guy in the peloton, the great Jens Voigt! Jens will be Race Pace Bicycles in TOWSON for a fun evening that will include a Q&A session and a photo & autograph opportunity. Admission is $10 and 100% of the proceeds will be donated to local bike advocacy ($5 to Bikemore and $5 Bike Maryland) and includes a limited edition poster and light refreshments. Hope to see you there! Get your tickets! // Invite your friends! We are preparing to reopen for the Spring season and we need to clear out our storage space! We have bikes that can meet anyone's needs. Road bikes, mountain bikes, BMX, old bikes, new bikes, odd bike frames, adult bikes, toddler tricycles, name brand bikes (if you look hard enough)... A biker's dream! So if you are prepping for the Spring season and want a new ride, come to our Buy As Is Sale!!!! We will not be providing any tune ups or parts to repair any bike. But you can sign up for our adult workshops on site. Food, fun, and good vibes with Youth in Business! 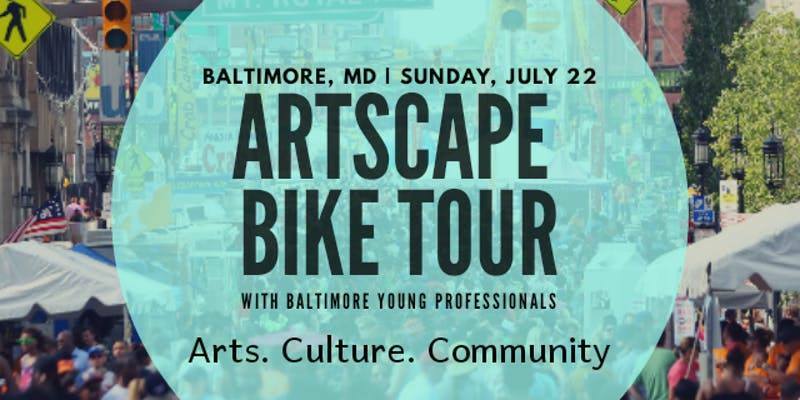 If you love Baltimore, community, food, and good vibes join us Thursday to mingle with other like minded Bike and Brunch Tours will host its monthly Maintenance and Mingle event with a very special co-host, Youth in Business! Come and tell your friends. These young members of the business community have exciting news about services that may be of benefit to some professional organizations, businesses and individuals. They will also have merchandise on site. Check out their Instagram page and website. We will also have happy hour specials that include food. Young people are welcome. What more do you need for a good time. Oh yes, specials! We'll have those too. Happy hour specials include drinks (not for the youth of course) and food favorites. Curious about the variety of libations? 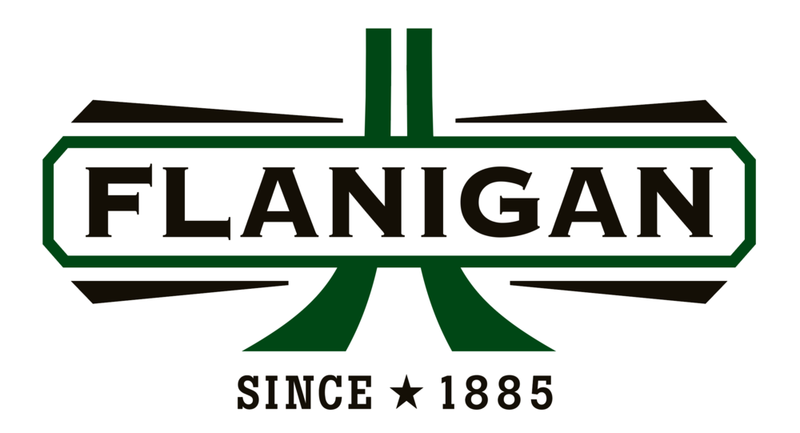 They range from local beers, wine, and topical crafted cocktails as well as non- alcoholic items like tea, espresso, Jarittos, and food like include pizza, nachos, and stuff for vegans and carnivores alike. Join cyclists, aspiring cyclists, and friends for Maintenance and Mingle! Thursday, February 28th, 6:00pm - 8:00pm. This is a YiB special edition. Get information, ask questions and learn about their services, merchandise, and more. Follow the sounds and look for the huge overhead door. If we have even greater luck the one and only, Mountain Bike Champion and co-owner, Marla Streb might lead some or all of the short bike tips and maintenance break-out session during the event. This event is open to all, No bikes or bike know how requires. This is purely social. Mingle among the company of other local #bikeLovers and #CycleLife fans and find ride partners. Buy a T-shirt, talk with us about tours, find out about local events on and off the bike, and connect to people engaged in building community and preserving history, legacy, and culture during what will be a very happy hour and a one of a kind event. A portion of the proceeds from Bike and Brunch Tours merchandise sales at this event will go to the Youth in Business program. Advance purchase of merchandise is available below. Follow #MaintenanceandMingle for more details. About Jubilee Arts: Jubilee is a community program providing arts classes to the residents of the Sandtown-Winchester, Upton, and surrounding neighborhoods in Baltimore, Maryland. Jubilee Arts is located on Pennsylvania Avenue, an area with a rich history of African-American culture, and is helping to bring the arts back to life in our community! We offer programming in dance, visual arts, creative writing and ceramics in partnership with the Maryland Institute College of Art, Baltimore Clayworks, area artists and writers, and dancers. 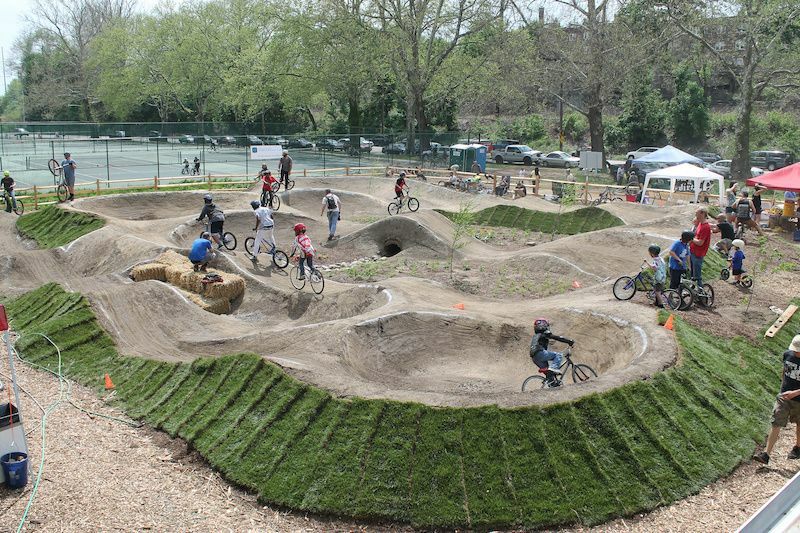 South Baltimore Gateway Partnership and community leaders are exploring creative ways to temporarily use property in Westport for a community pump track — and we want to hear your ideas! This intent is to create a space for all Baltimoreans, a space that's free to use and where neighbors can feel comfortable and safe biking without danger or harassment. A pump track is a small looping trail system that you can ride without pedaling much, as you move with the momentum of going up and down the small hills and berms. They can be made of dirt and maintained by volunteers, and can be fun and challenging for a wide range of ages in a relatively small space. Partners are just beginning the conversation around what a pump track in Westport would involve and look like, so come out to share your thoughts and ideas. Join the Baltimore Greenway Trails Coalition for our next meeting on Thursday, Jan. 31, at Monument City Brewing Company. For this meeting, we are taking our show on the road to the future Highlandtown Rail-Trail! We'll be celebrating the success of the past year and looking ahead with some exciting design presentations of the southeast portions of the future trail network! A special thanks to the AIA Baltimore Chapter and the Urban Design Committee for partnering with us on this exciting project. -Have a local beer in a future trail-side business! The Baltimore Greenway Trails Coalition is coalition of over 70 organizations and neighborhoods advocating for a 35 mile trail network connecting the city's trails, parks, neighborhoods, and popular destinations through healthy, green transportation to celebrate Baltimore's neighborhoods and landscapes! Our Complete Streets Bill is going to become the LAW! After two years of working with Councilman Ryan Dorsey and a coalition of local and national partners, tomorrow it becomes law that Baltimore City road projects must prioritize the safety of all people using the streets over the speed of moving cars. While there is still a lot of work to be done to ensure implementation is effective, this is big. Thank you for helping us get this far! Come by City Hall to celebrate and show your support! 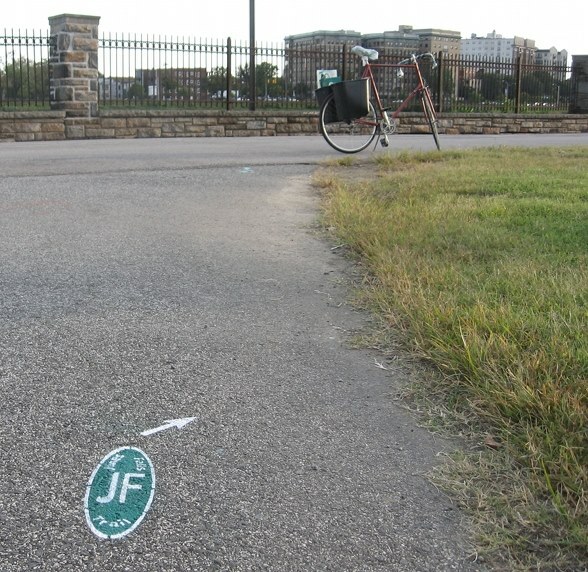 Bikemore & Jubilee Arts has been engaging with neighbors and artists working to bring public art to the neighborhood that highlights the connection between the neighborhood and the park. Kim Loper of Jubilee Arts was selected by a committee of neighbors to install a temporary public art piece. For the past few weeks she's worked with neighbors, artists, and city agencies to complete the project...and we are almost done! On Sunday the 18th there will be an unveiling of the work and a recognition of everyone who has provided input, the artists, and the project's sponsors. We will be serving light refreshments and invite all to attend. Please invite your neighbors! No RSVP required. Complete Streets is heading to Third Reader! If the City Council votes to approve the Complete Streets bill on Third Reader, it will become officially approved by the City Council and head to Mayor Pugh's desk for her signature. Complete Streets are an essential part of creating a Baltimore that is healthy, safe and provides access to opportunity for all. But Baltimore continued to fall behind cities all across America in designing streets that prioritized the safety of people over the speed of cars. Rather than pin our hopes on a single elected or appointed leader — we took action. On October 29th, we get to celebrate the results of two years of direct lobbying, drafting legislation, educating the public, and building a coalition. None of which would have been possible without your support. Join us in both celebrating and seeing this through the finish line! Join us in Council Chambers to celebrate this milestone with the Complete Streets Coalition. The Council meeting begins at 5:00, but show up early to get in the building and hopefully get a seat. ID required to enter the building. Then join us at Penn and Quill to celebrate this huge accomplishment! Bike & Brunch and Bikemore are are teaming up for October's Baltimore Maintenance and Mingle! Good company, cold #drinks, #goodvibes, and bikes! What more do you need for a great time. Join cyclists, aspiring cyclists, friends and Bike and Brunch Tours for Maintenance and Mingle! This is a great event for casual recreational riders, entry-level cyclist, commuters, or people who want to connect with other cyclist off the road. Sip, eat, vibe, find ride partners and get information about activities, social rides, and events that cater to these levels. All levels welcome whether you are learning to ride or an aspiring pro. Bikemore is joining in for a special I Bike, I Vote edition! Have questions about the election, polling locations, or how your vote can impact what our streets look like? Bikemore staff and friends will be there to chat! This happy hour aims to create a space for black cyclist, people of color, and those who support the communities, issues, and interests specific to us. This event is open to all. Mingle among the company of other local #bikeLovers and #CycleLife fans. Buy merchandise, talk with us about upcoming rides and tours, subscribe for information about future events, and meet new ride partners during what will be a very happy hour and a one of a kind event. Bring your light up bikes, shoes, clothes, glosticks, etc and move in the spirit of both working out and promoting non-violence. The event will raise awareness for October’s Domestic Violence month, November’s Batlimore CeaseFire weekend, and local social advocacy groups/organizations. We're celebrating the Big Jump with a big block party! We'll have food, music and interactive art. Plus group bike rides, walking tours and family friendly activities in the Big Jump path. Free | RSVP + invite your friends and neighbors! What's the Big Jump? The Big Jump is a new path accessible by foot, bike, and mobility devices along Druid Park Lake Drive and 28th Street. It connects neighbors to jobs and recreation, and allows people who use mobility devices to cross 83 safely and easily for the first time. Read more about it. Partners: The Big Jump and this event are a partnership of Councilman Leon Pinkett, Baltimore City Department of Transportation, PeopleForBikes, Bikemore, neighbors + advocates. Get involved! Want to sponsor the Big Jump Block Party, bring out your step team, be a food vendor, volunteer, or something else? Email danielle@bikemore.net to get involved! Our Mobile Bike Shop will be stationed at the 13th Annual Reservoir Hill Resource Fair and Music Festival! 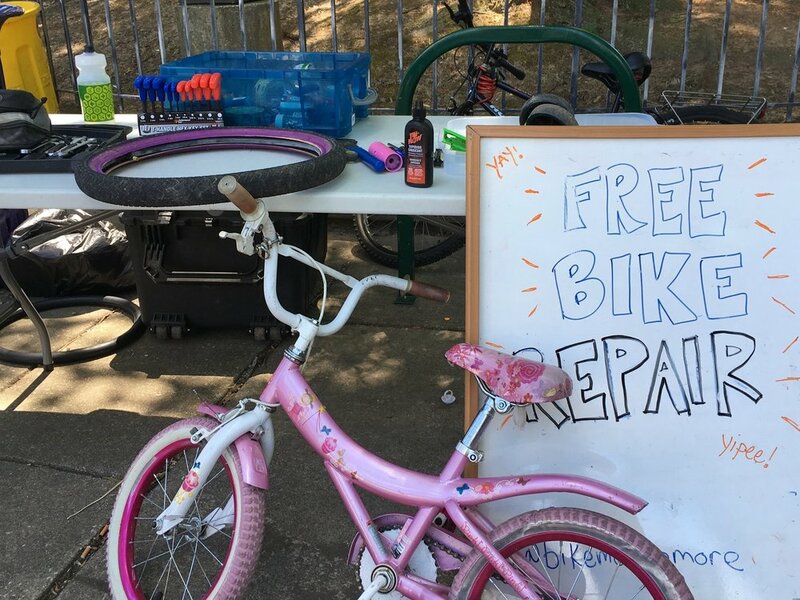 Our Mobile Bike Shop provides free bike repairs by partnering with community events in neighborhoods that lack brick and mortar bike shops. So bring your bike over and we'll help you get rolling again! We work on both kids and adult bikes, and we're always happy to show you how to fix something and answer any questions you have about your bike. Come come to the Charm City Farm and Garden Bus and Bike Tours 2018 organized by the UME Baltimore City Master Gardeners! There will be two different routes, one for bikes and one for the bus, that will take us across the City to tour some of the amazing Community Gardens in Baltimore! Did you know there are over 200 Community Gardens in Baltimore City and over 20 Urban Farms!? They grow everything from Apples to Zinnias and they cultivate community at the same time. The Bike Tour start from the same location at Civic Works' Clifton Park Mansion: 2701 St Lo Drive, Baltimore, MD 21213. 8:30am - Bike Tour leaves! Please bring your own bike, helmet, sunscreen, and water! We will provide snacks and have additional water in a vehicle that will follow behind. * Rain Date: August 4th. This rain date is for the BIKE TOUR ONLY. Should this come up, you will be contacted directly the morning of the event by 7:30am. We're casting people who bike to participate in a fun trail photoshoot! Baltimore Greenway Trails Coalition is hosting a photoshoot to start collecting high quality impactful images that show Baltimoreans using trails for fun, for recreation, for exercise or as part of their everyday routine living, working, and playing in Baltimore. These images will be used in trail promotion materials, both online and in print as we continue celebrate and promote the power of trail as community assets in Baltimore. The ride will start and end outside of the Conservancy at Druid Hill Park. The route will be a slow paced ride on the Jones Falls Trail, no more than a 4 miles total, with lots of stops for photos. Regular clothes, not just bike kits, are encouraged. Families, individuals, kids, all ages, everyone is welcome! Interested? Apply here by uploading a photo of you and your bike. We'll be in touch to confirm your participation and with additional details.